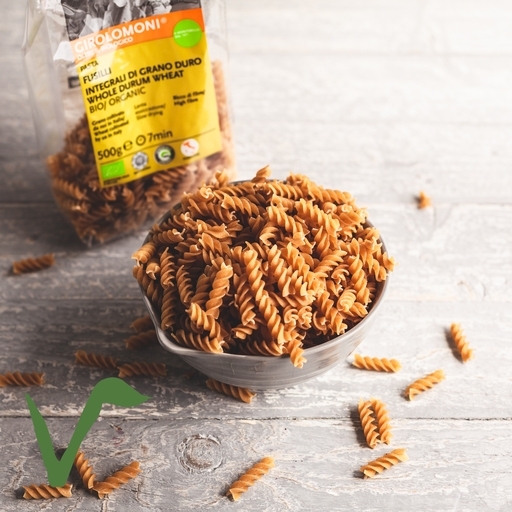 Organic wholewheat fusilli pasta made by an Italian co-op using their own durum wheat. Slow-dried for a deep, nutty flavour, and shaped with traditional bronze dies for a rougher surface that holds onto sauces and seasoning. Fusilli’s spiral shape is great for trapping thin sauces, or standing up to chunky ones. It bakes well in casseroles, as in this leek and goat's cheese pasta bake. Wholewheat fussili takes only 10-12 mins to boil. Eat with spinach and Parmesan for a quick, healthy vegetarian dinner, or with black kale and lamb's liver for a bolder dish. It also bakes well in casseroles topped with plenty of golden, bubbling cheese. Whole-wheat pasta contains natural oils that mean it’ll go bad faster than white pasta, so keep it somewhere cool and dry and eat it within a few months. Whole wheat Durum semolina (100%).